Just published 2012. How Do You Kill 11 Million People, Why the truth matters more than you think. Controversial title, but persuasive conclusion. 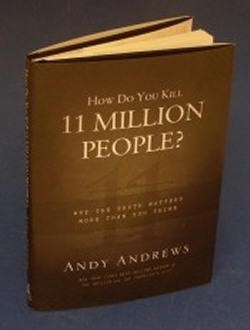 Andy Andrews, a NY Times best selling author asks the question: How did the Nazi's kill so many people? In fact he goes beyond that. He asks the question, how does anyone kill millions of people, even up to 25% of the population with almost no opposition? The answer to the question is the key to our future. Andrews issues a wake-up call: become an informed, passionate citizen who demands honesty and integrity from our leaders, or suffer the consequences of our own ignorance and apathy. Furthermore, we can no longer measure a leader's worth by the yardsticks provided by the left or the right. Instead, we must use an unchanging standard: the pure, unvarnished truth." The book is compact and can be read in just 20 minutes, but it'll change the rest of your life, and maybe the world. This book is free for orders over $250 but you can buy extra copies here at a substantial discount.